Architects and building owners are increasingly turning to prepainted metal to meet their design vision for both commercial and residential installations. Prepainted metal’s ability to be formed into almost any shape, excellent resistance to weathering for superior longevity, infinite aesthetic color and texture options, and positive environmental benefits, make it a perfect choice for both interior and exterior construction applications. Prepainted metal roof panels are produced in a wide array of shapes by a large selection of manufacturers to meet any design need. 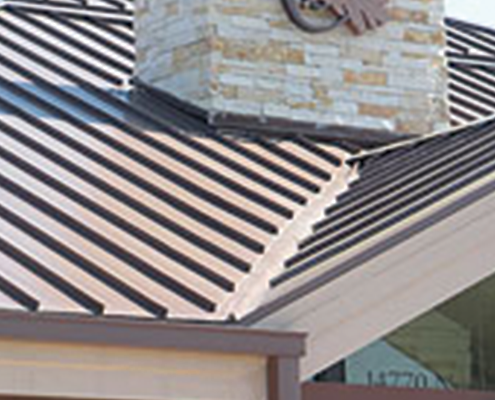 Metal roofing profiles are generally separated into two major categories including standing seam and formed shapes. Standing seam roofing panels are roll formed into almost any length and are available in both exposed and hidden fastener systems. Formed shape prepainted roofing systems transforms metal roofing into profiles that look like clay tile, slate, cedar shakes, shingles, and more. In addition to beauty, longevity, and functionality, prepainted metal is available in “cool” infrared reflective pigment technology. This technology saves energy (and money) on cooling by helping reduce a building’s interior temperature. Prepainted metal is a perfect choice for most interior and exterior wall panels. Metal wall panels are available in a large number of differing profiles in ribbed, insulated (foamed), composite, and architectural shallow flat styles. Soffit, fascia, and an assortment of other building trim parts are produced out of prepainted metal helping a home or business streamline its looks while protecting the underlying structure. Prepainted metal’s ability to be formed into almost any contortion of shapes imaginable make it a popular choice for manufacturing gutters and downspouts, as well as a wide assortment of parts needed for rainware installations. Another rising use of prepainted metal is for various leaf and debris prevention systems that have recently been introduced to the market. Prepainted metal’s ability to be stamped into deeply drawn and detailed shapes, resistance to weathering, economical benefits, and environmental advantages makes it a perfect fit for Garage and Entry door manufacturers. Self storage units are being constructed at a rapid pace across the United States as the need for homeowners and businesses to store materials off-site increases. Prepainted metal is used for almost every part of these structures including roofing, walling, rainware, and even the roll-up doors. Prepainted metal is used extensively in interior building design. Sometimes its use is subtle and becomes an integral part of the design, and sometimes the metal itself is the major focus of the design. Ceiling tiles, back splashes, ceiling grids, wall panels, wainscoting, and column surrounds are some of the uses of prepainted metal for interiors.